It was raining large part of the night and I can hear every drop hitting the metal roof as our room was on the top floor with very little or no insulation. The temperature inside was pretty much the same as outside. I typically slept in a merino wool top and bottom base layer, second layer of fleece (both top and bottom), a down vest, merino wool socks with a liner, a woolen buff and skull-cap and fully covered myself under hotel provided thick blanket. Even with all of these layers, I was feeling cold. Sleepless nights is becoming a new normal for me, and to some extent, my room-mate Kamlesh. I blame it to the higher altitude and Diamox as I have no trouble sleeping at sea level. It was a very uncomfortable situation because I was tired from the day’s hike and really wanted to sleep but could not. Doctor Saheb carried a Pulse Oxymeter and frequently measured our Blood Oxygen levels and Pulse rate to make sure we are doing OK. Doctor suggested to sleep with upper body elevated, which I guess makes your breathing better, so Kamlesh and I had our backpacks and extra stuff piled up on our pillows all night. I pretty much spent all night making Diamox inspired bathroom runs and trying every position physically possible on a short narrow bed to sleep – but no luck. Kamlesh and I talked for a while, I reviewed photos on my camera (while worrying about draining my only camera battery), we played a guessing game of who is snoring next door, etc. The walls of these hotels are paper-thin and you can hear every move next door. 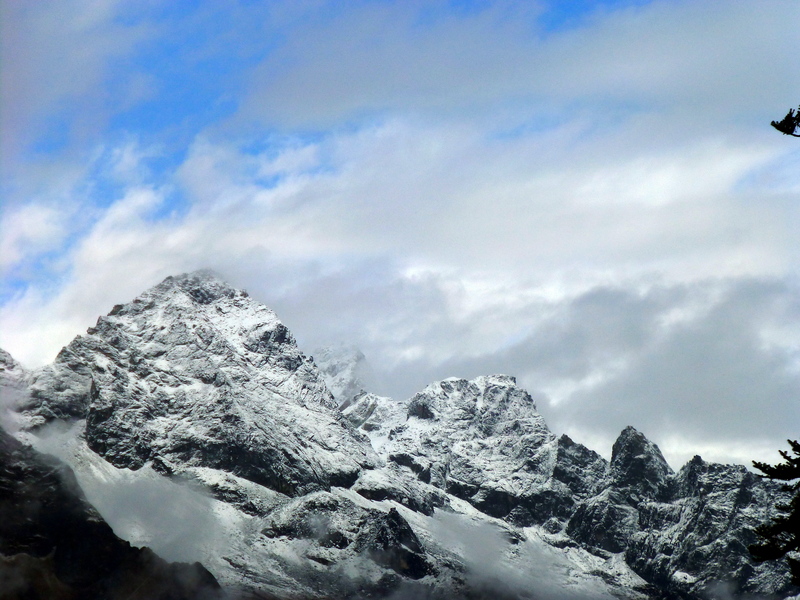 All of a sudden, I heard light knocks on our door – it was Dr. Dipak telling us to wake up and go outside to see beautiful snow-covered mountains. This routine was repeated pretty much every day throughout the EBC trek. 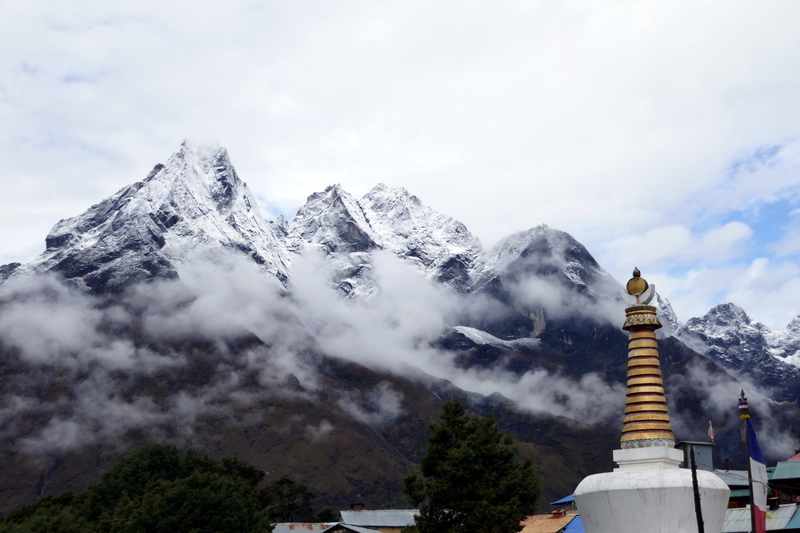 Before braving to put one more layer and explore outside, I opened the sliding glass window in our room and was speechless with awe-inspiring view of the Tengboche monastery with snow-capped mountains in the backdrop. 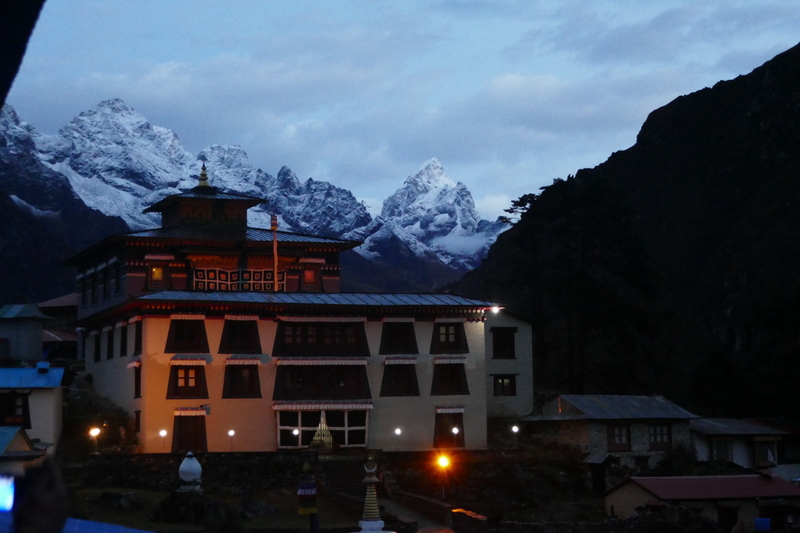 The warm orange glow of the flood lights on the monastery was contrasting well with light blue snow on the mountain (see images below). 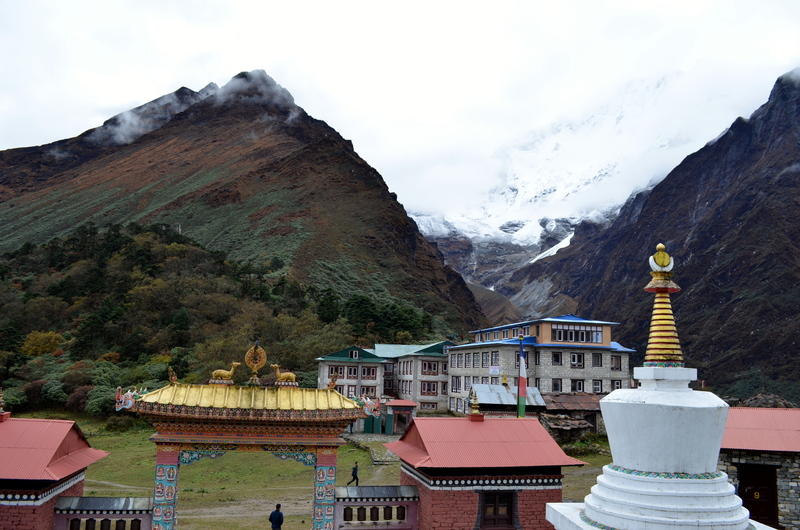 The monastery roof had a thin film of ice from overnight rain reflecting the mountain peaks. It was magical, period. Before it gets too bright, I pulled out my iPhone and took the following video clip hanging out from my third floor window as our room was not directly facing the monastery. I quickly put on my shoes and grab my camera to join our team outside. This was our first exposure to the majestic mountains of Himalayas. 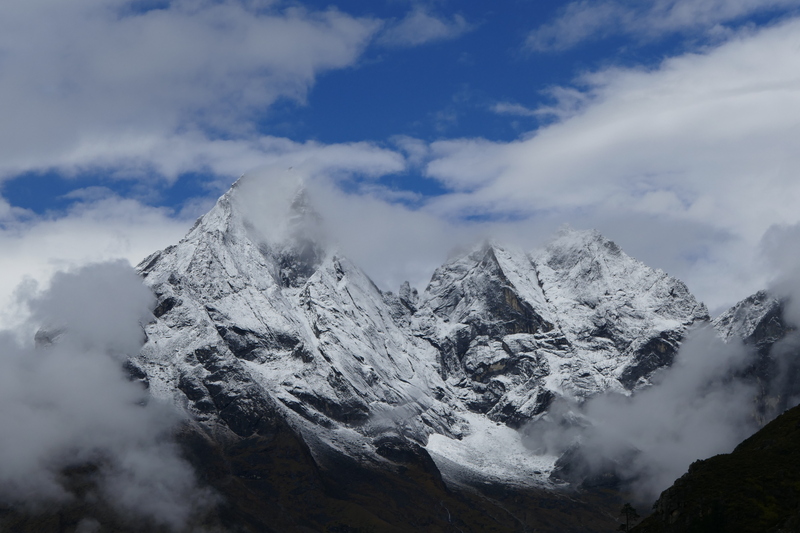 When we arrived to Tengboche yesterday, the mountains were hiding behind the thick fog and clouds so we didn’t see them till today. 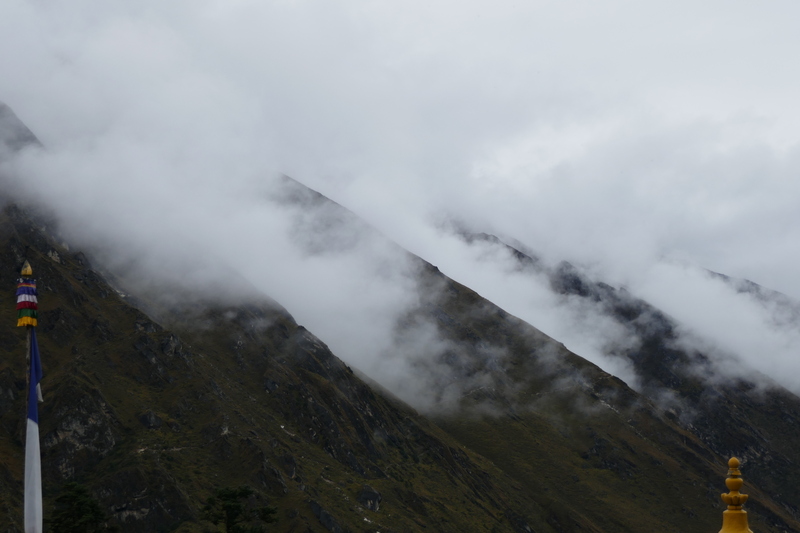 This was the case throughout our EBC trek where you see the mountains till about 11 am and then they all go into hiding. We were outside till sunrise absorbing the morning glory of Himalayas – my first introduction to the sacred Sagarmatha mountain range. 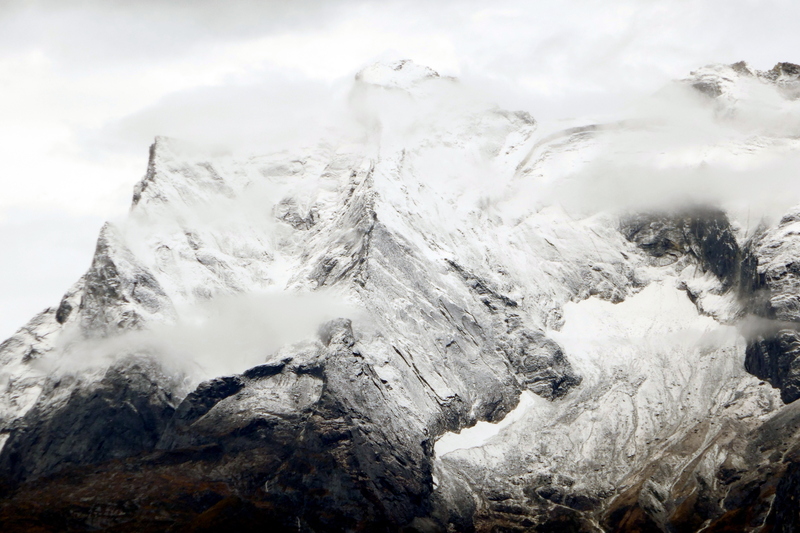 Living in the US, I have extensively traveled in Northern America and seen snow-capped mountains from California to Alaska but there is some thing different about Himalayas – I hope some day I will be able to verbalize it. On our way to the Monastery. The morning prayer ceremony at the monastery was going to start soon so I rushed back to the hotel to see if I can shower before joining for the morning prayer but as always, there is a long line for shower and I didn’t get my turn in time for attending the prayer ceremony. I could have gone there without shower, in my stinky overnight clothes, but felt it was not appropriate so missed a great opportunity to witness the morning ritual at the monastery. Oh well, one more reason to come back here. The views of snow-covered mountains kept all of us busy before we get ready for the trek. One of my favorite photos from Tengboche (below) was clicked by Varun on his Samsung Note 7. After reviewing thousands of photographs we collectively took during the EBC trek, I am very much impressed by the quality of this camera phone! Too bad it’s been recalled. Here is an aerial view of the same monastery from a helicopter on our return trip. I took many aerial photos of the trails, villages, and landmarks and It took me a while to identify them and put them side by side with ground level photos. 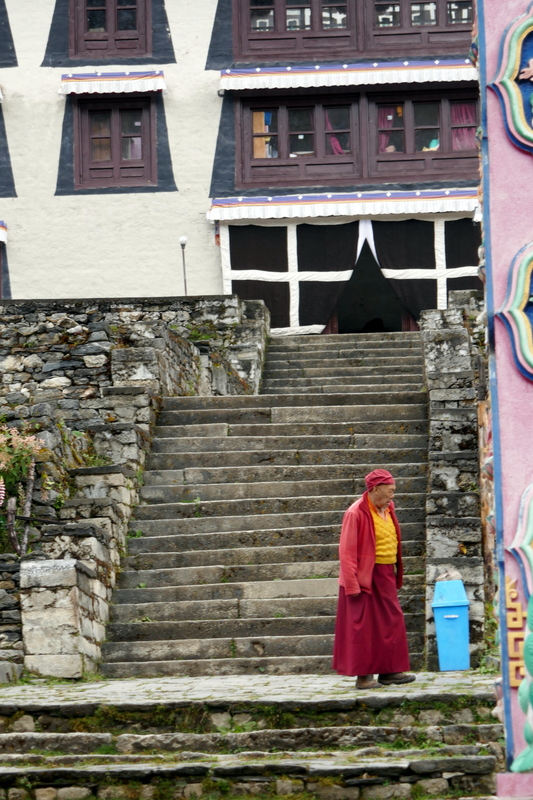 Between our hotel and the monastery, there was trail junction made up of buddhist mantra tablets, with directional sign pointing to Namche Bazaar. Our trail started from here going between our hotel and the monastery. One last look at hotel from the monastery on our way to Dingboche. We passed between our hotel and monastery through the town. Tengboche is a very small village with a few hotels and restaurants and I believe our hotel was the biggest and best! As we are leaving the town, the sun came out briefly and the sunshine on the mountains kept us busy taking photos for a while. While on the EBC trek – there is no hurry to reach anywhere, Dingboche will still be there if we reach at middle of the night. I am not a destination traveler any fully believe in enjoying the journey. 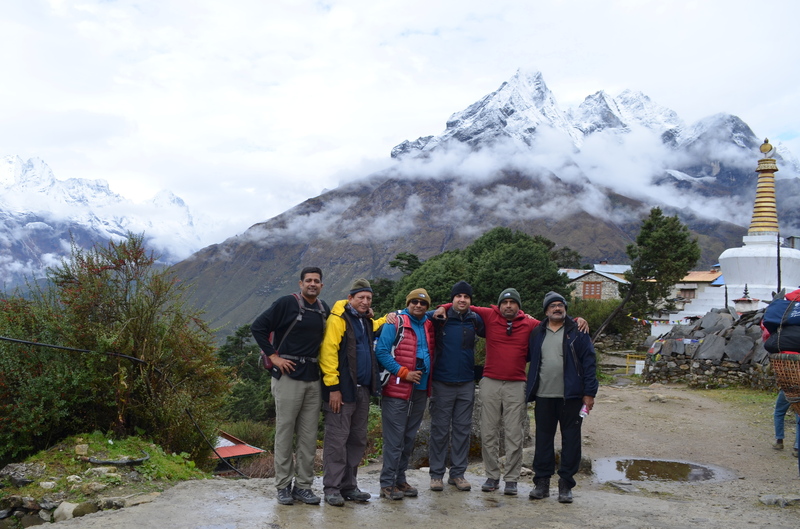 In our group we were a total of 11 people; six of us, two guides, and three porters. Through out the EBC trek, we were scattered in smaller groups (except lunch time) taking our time to hike and photograph. First rays of sun on Himalayan mountain range. 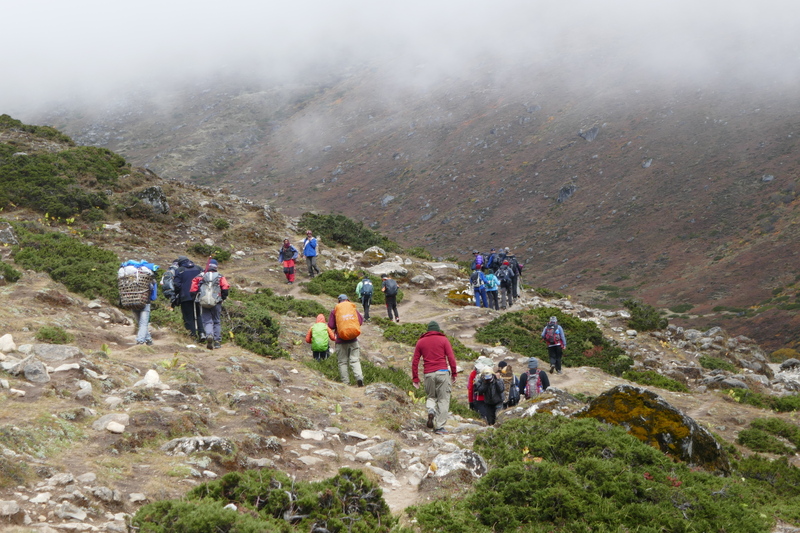 What I observed throughout the EBC trek, is that the weather changes very fast, cloud disappear and reappear in minutes and the interplay of sunlight and clouds changes the scenery to a complete new form. I wish I had written down the names of all of these mountains. The only one I can easily recognize is Ama Dablam (the last picture below). 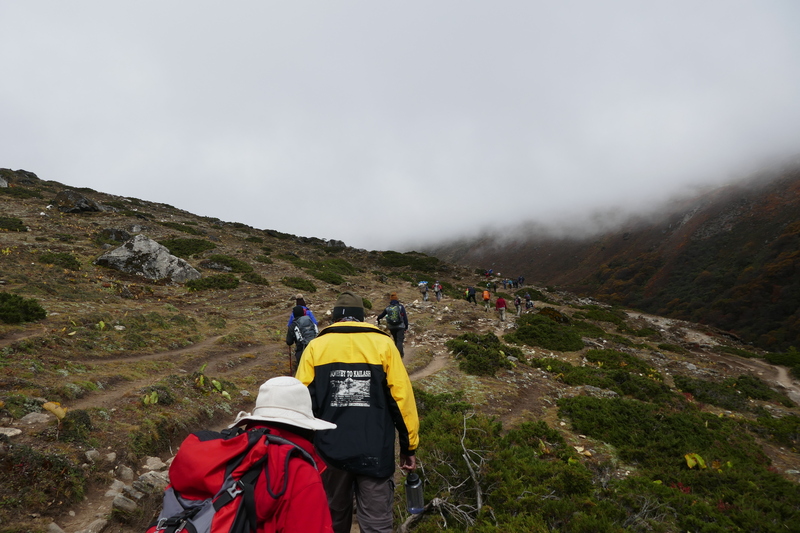 The trek between Tengboche and Dingboche is different compared to what we have been to so far. First of all, we are going at higher elevation so the landscape is changing with less trees and progressively becoming barren. Second, the trails are more rugged and less maintained. And third – it gets cold and windy. We all started using our gloves, buff, and beanies. I don’t think I saw any more colorful prayer wheels after Tengboche – the only one I saw was a water powered prayer wheel little far from the trail on a stream. Lush green forest along the trail. The initial part of the trail is going through a flat land, followed by a steep descent through a forest of some unknown tress that somehow reminded me of Willow trees from back home (California), some conifers and rhododendrons. From the overnight rain, the trail was wet and muddy in several areas. 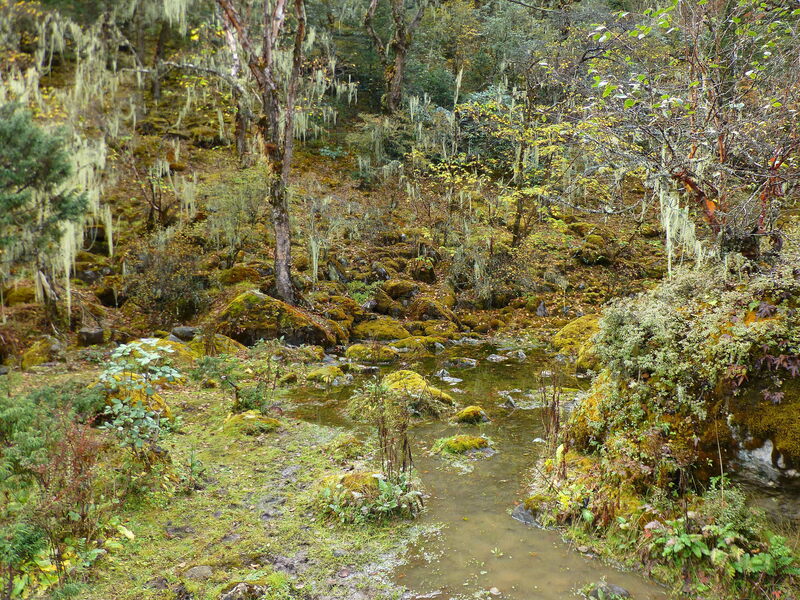 There were some water puddles formed from the overnight rain reflecting the moss-covered trees. Along the way, Manubhai spotted a boulder with several trees growing out of it in all directions. It was really interesting, see a video clip below. After passing the forest, we come to see a collapsed metal bridge awkwardly hanging over the river Imja Khola. My first thought was that it happened during the devastating earthquake in Nepal last year but my guide said it was due to a rock slide before that. Collapsed bridge on Imja Khola river along the trail. Fortunately, there is another bridge down the trail that we will be using to cross the river Imja Khola (see picture below). 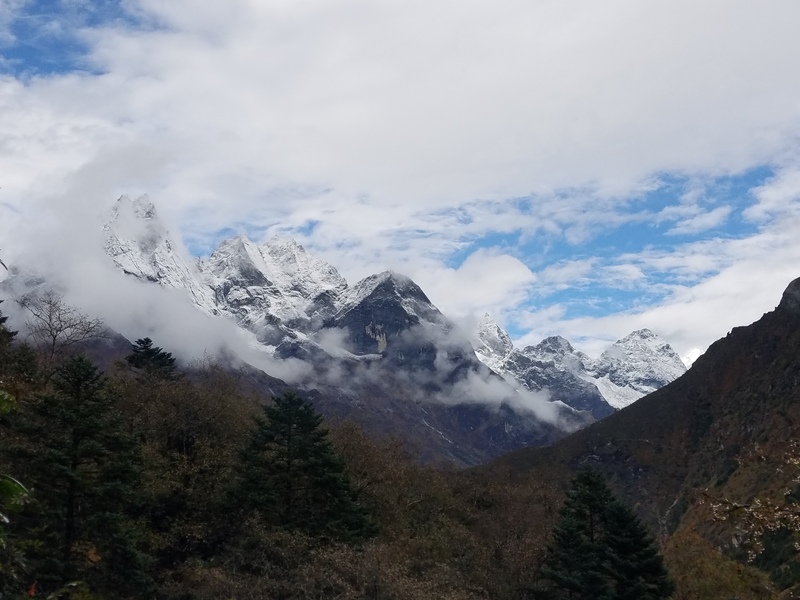 If you see above the valley you can barely see the outline of Ama Dablam as majority of the mountain is hidden behind clouds. 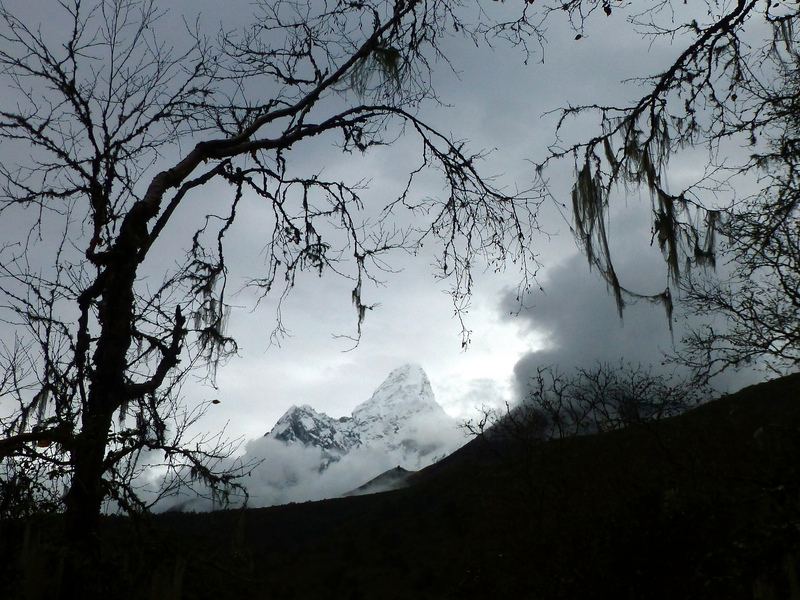 The towering Ama Dablam mountain becomes a constant companion from now on. River with a new bridge and Mt. Ama Dablam in the backdrop. Here is a video clip from the same location showing Imja Khola river, Ama Dablam, and toward the end of the clip, the collapsed bridge. The trail after the river goes up to the town of Pangboche. 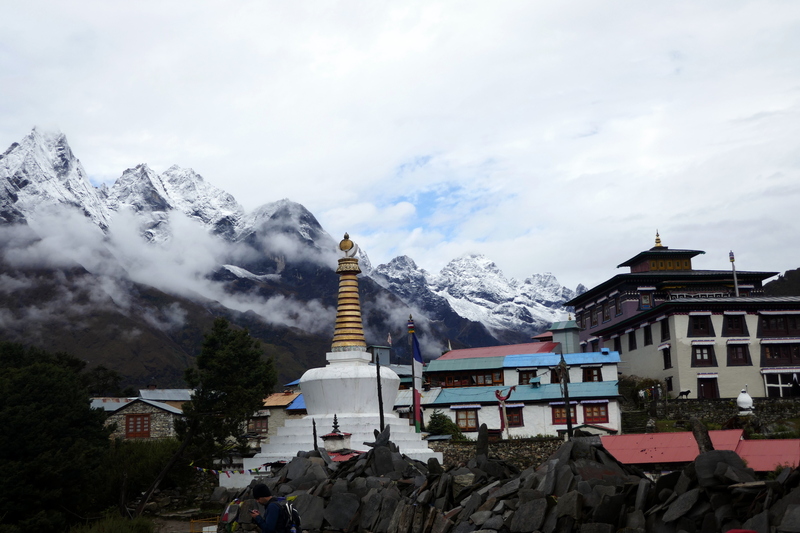 On the way we see a beautiful buddhist stupa with Ama Dablam in the background. 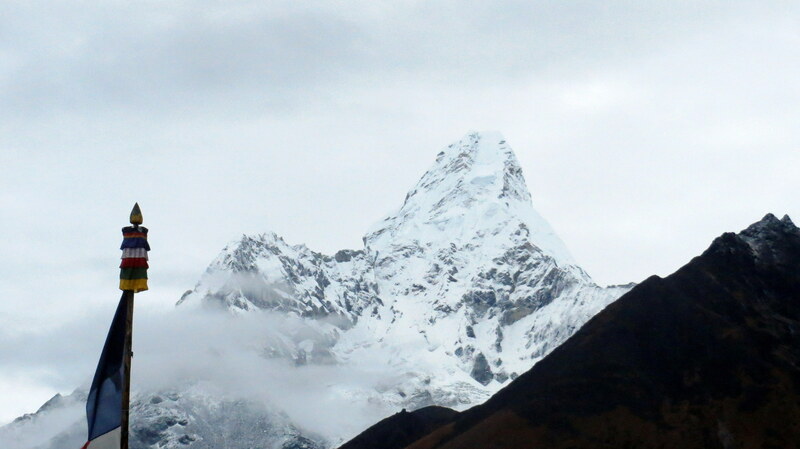 Again, clouds are covering Ama Dablam in the background. I can tell with certainty that this would be a great photo spot on a clear day without clouds covering the mountains behind. The header image on this page is a close-up image of the Buddha’s eyes from this Stupa. Throughout my trip to Nepal, almost all the Buddhist stupas I have seen have painting of Buddha’s eyes in all four directions. These eyes are known as wisdom eyes symbolizing omniscience of Buddha – seeing in all four directions. These religious symbol is very popular and is everywhere, from refrigerator magnets to souvenir t-shirts, almost like a national identity of Nepal. If you look closely, you will see a question mark like symbol between the eyes, it is Nepali character for number “1” (some Indian scripts also has a similar character, like this one), which is a symbolic representation of unity among all things. There is also another symbol above this symbol – between the eyes. This symbol is known as a third eye, which I believe is derived from Hinduism. Third eye symbolizes all seeing wisdom of the Buddha. 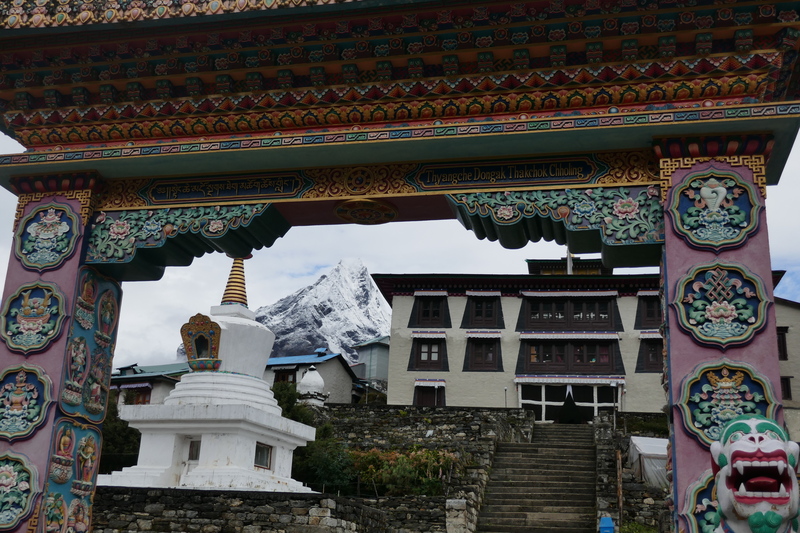 About two hours from Tengboche, after crossing Imja Khola river, we arrive at a small village, Pangboche. 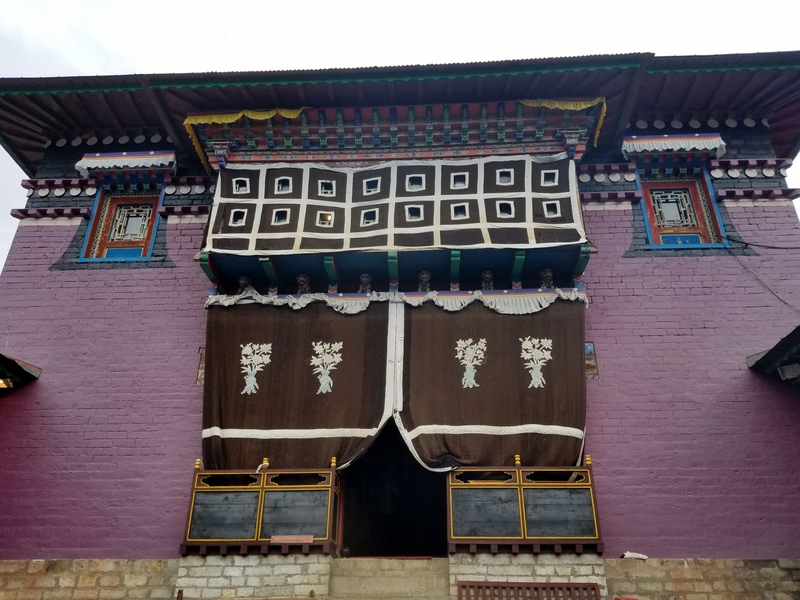 It does not look like a popular night stay place along the EBC trek because its only two-hour trek from Tengboche and due to the famous Tengboche monastery, most hikers stay overnight there. For the first time on the EBC trail, I saw a local vendor selling meat out in the open. Not sure what it was but didn’t look like it was in a hygienic conditions. 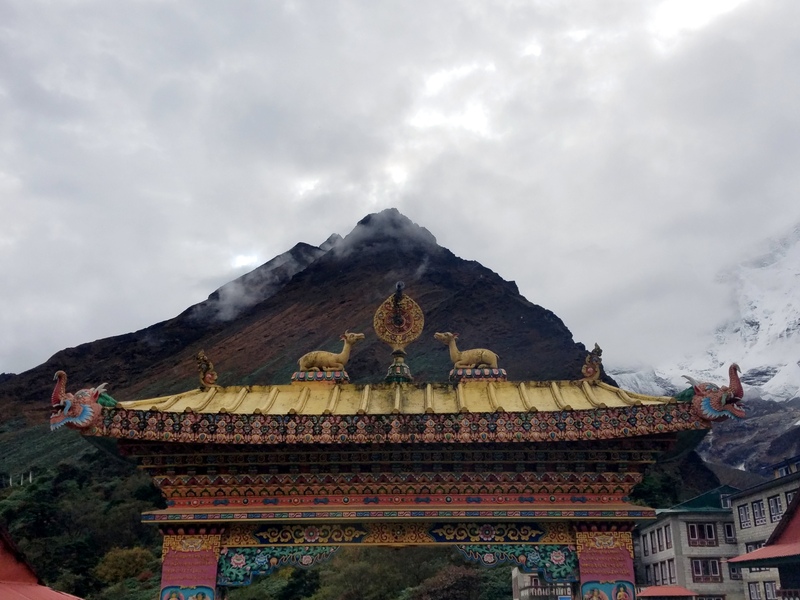 I am a lifelong vegetarian so its irrelevant to me but experienced travelers advise not to eat any meat while on the EBC trek – perhaps due to the lack of refrigeration and proper hygienic conditions handling such food products. 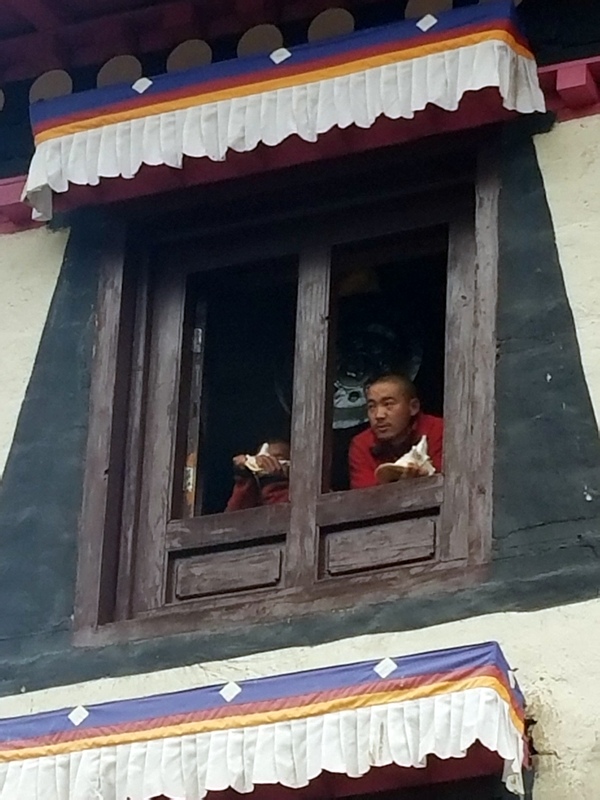 While going through the town, I spotted a very adorable baby sherpani seating alone on a stone ledge outside Namaste lodge (under watchful eyes of her mother through the window). When I gave her a small coloring book with crayons, she looked at her mom for approval which, of course she received. Her mom thanked me and offered a cup of tea but we were lagging behind our group so I respectfully declined. A very adorable baby Sherpani at Pengboche. 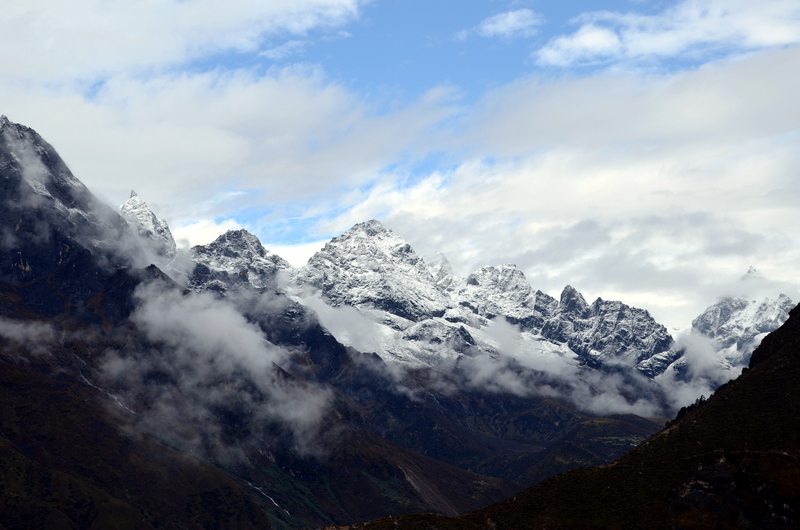 The trail after Pangboche runs along mountain slope parallel to the river providing beautiful vistas of the valley. I spotted a group of hikers and locals curiously looking at something along the river bed. The trail was too high to figure out what it was with naked eyes. Fortunately, my Panasonic Lumix ZS100 extended zoom (250 mm) captured a close up view of the mountain goats. Hikers and locals looking at mountain goats along the river bed. Mountain goat along the river. After that, we pass through a couple of small towns – and stop for lunch at Shomare. 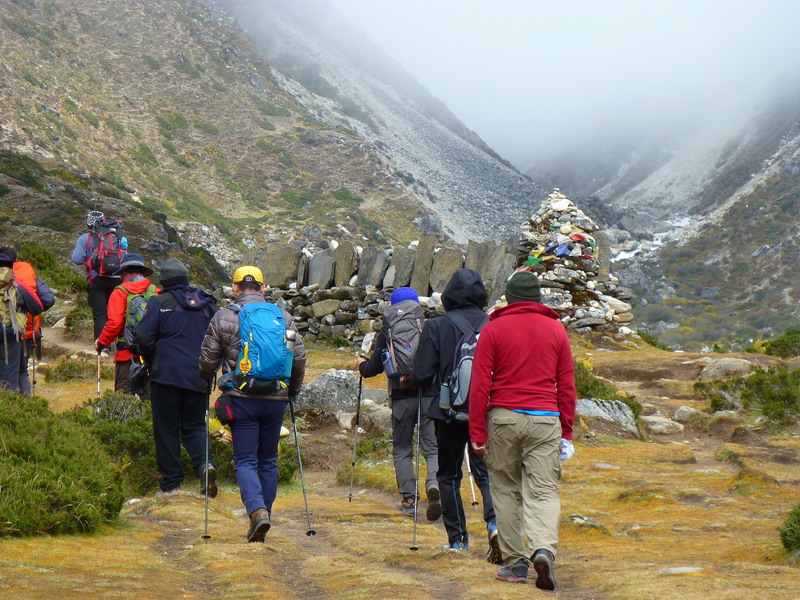 After lunch we trek along the Imja valley all the way to Dingboche village. A wayward yak along the river. I noticed the effect of higher elevation (and not having enough sleep last night) and found resting more frequently than earlier. There are beautiful vista points along the trail providing both rest and practicing photography. After our usual Dal-Bhat lunch – the landscape is without tall trees with scattered bushes of colorful foliage. According to Tshering, in good weather you can see Mt. Everest flanked by Lhotse and Nuptse from this part of the trek. 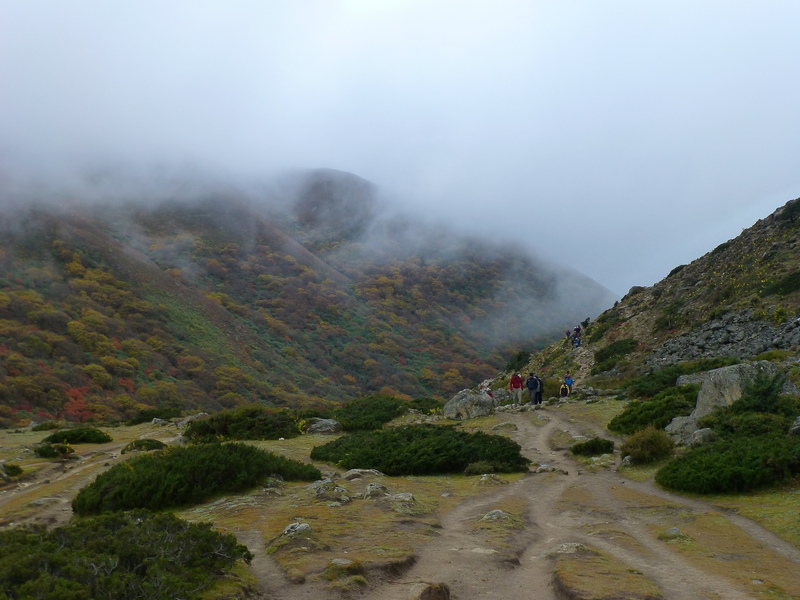 I guess “good weather” means trekking March-May time as cloud cover rolled in after mid morning pretty much everyday during our October trek. With over 30,000 people trekking to the Everest Base Camp each year, there is plenty of company on the trek. Majority of the hikers follow a very similar itinerary so you keep running into each other along the trail and at the hotels. Manubhai made friendship with a Korean hiker on the trail and we kept running into them next 2-3 days. Manubhai with his Korean trail friend. 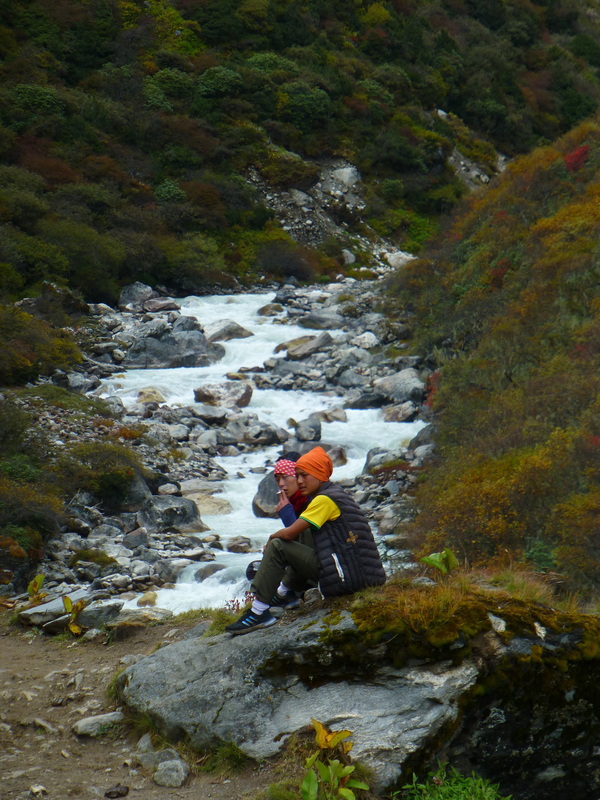 After Shomare, the trail splits, one goes towards Dingboche and the other to Pheriche. The trail to Dingboche initially goes through a descent to cross Khumbu Khola before a gradual climb towards our final destination for the day, Dingboche. It has been two hours since we left Shomare and the terrain drastically changed. 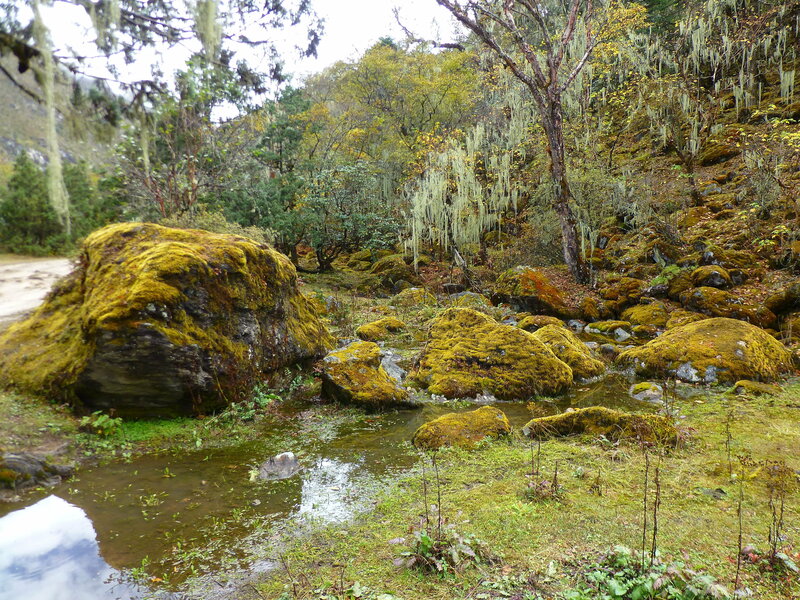 No more moss covered three and dense shrubs, the landscape becomes progressively barren – rocky with small bushes scattered over a vast plateau. The wind picks up and it starts getting colder.We also see several rock slides along the way – from a distance some rock slide areas look like glaciers because of white colors of stones. Along the way, we see small farming settlements with small stone homes and (mostly) potato farms. 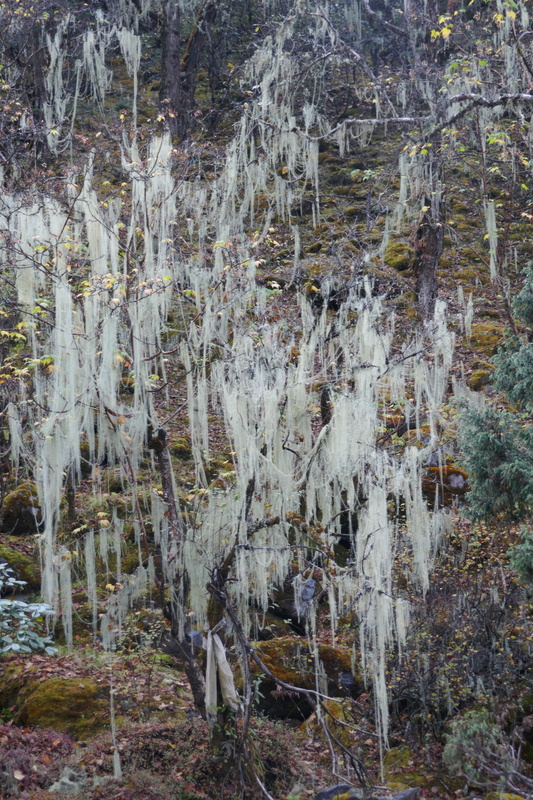 My guide tells me that they are seasonal farmers and generally spend their winter at lower elevation. 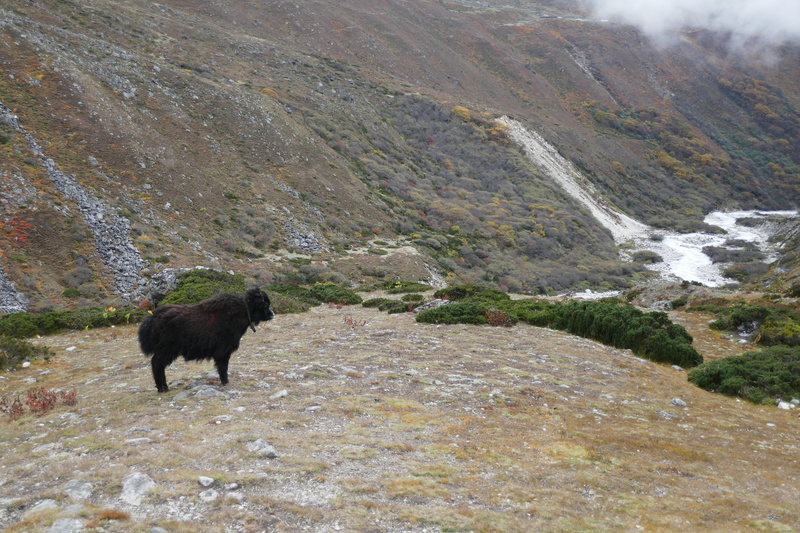 We see yaks grazing in farms bordered with stone walls. Finally, we arrive at Dingboche. Today’s hike was our first exposure to barren rocky terrain with high winds and cold. 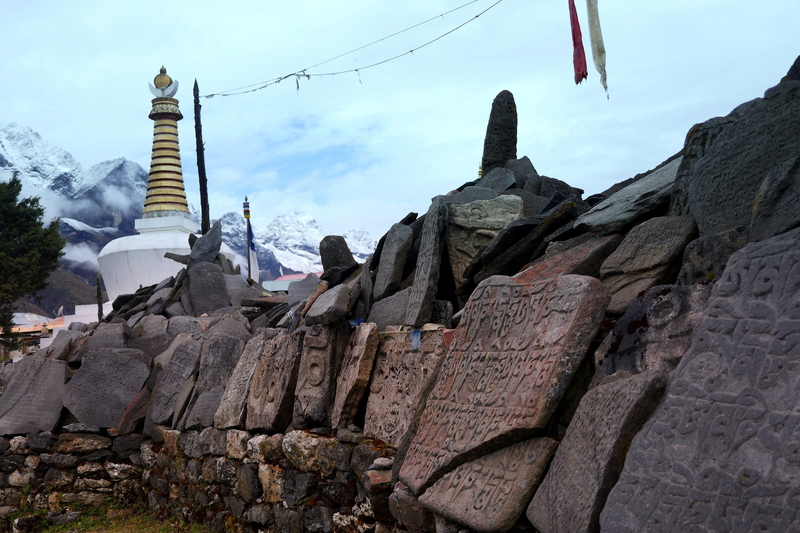 Buddhist stupa at the entrance of Dingboche town. First thing we do upon arrival is to have a warm tea at the hotel dinning hall. The stove is not fired yet so it was cold inside. This dining hall was very clean and well-organized. Finally, the stove is on so we hangout there. We are going to stay here for two nights, tomorrow we hike to Nagarjun peak for acclimatization. The hotel had an indoor cloth drying space (probably it was the old dining hall – under remodeling) so we decided to wash and dry some of our clothes hoping it will dry out by the time we leave day after tomorrow. After our usual dal-bhat dinner supplemented by some home brought snacks, I retire in my room for another sleepless night.